The Polynesian island Bora Bora in the South Pacific is widely touted as the most strikingly beautiful island in the world. Essentially, Bora Bora is a crumbling core of a tall extinct volcano that is surrounded by a tropical emerald-turquoise lagoon, which in turn is ringed by a string of islets, which in turn is surrounded by coral reefs. 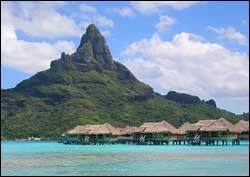 Bora Bora is dramatically crowned by two rugged volcano-core peaks draped with lush tropical foliage. One is as tall as a modern 200-story building.. However, the ideal visiting time is from May to September when sunny days abound. To reach this island paradise, most visitors take an international flight to Tahiti. From there, it's a 45-minute flight to Bora Bora.